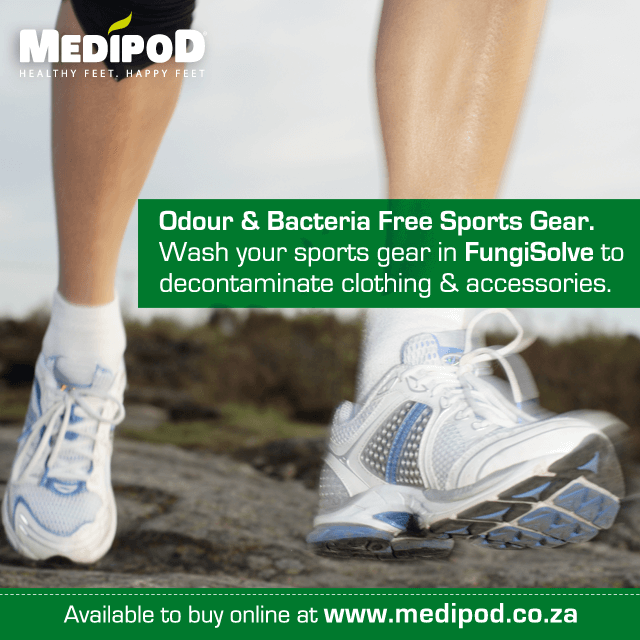 Pre-wash your shoes and running gear in FungiSolve. Give yourself a foot massage everyday. Medipod Foot Repair Cream is a 2-min a day spa in a tube. Fungal and bacterial infections often return, even after successful treatment with creams or drugs, pre-washing your running shoes will help your feet feel soft and comfortable while you run. Some people believe that hard skin will prevent blisters but this is a common misconception. Economic laundry solution, that decontaminates any materials even in cold water, in washing machine or by soaking. Scientific tests have shown that FungiSolve will not damage cloth, dye colour or stitching of expensive sports shoes and clothes. 4-way treatment: moisturises, exfoliates, combats fungi and deodorises. Medipod Foot Repair Cream moisturises, exfoliates and strengthens skin, as well as combats fungi and bacteria and the odours these infections cause. Prevents Athlete’s Foot, which requires warmth and moisture to survive and grow.